Believing that opera should be theater grounded in climatic expression that delivers larger-than-life stories and music that harnesses the full athletic thrill of singing, Evan Mack has devoted much of his compositional life to opera and song. His first major operatic composition, where he served as both composer and librettist, was Angel of the Amazon. “Angel” premiered in May of 2011 by Encompass New Opera Theatre at the Baryshnikov Arts Center in New York City and was subsequently released on CD worldwide by Albany Records. Two years later, Fresno State Opera Theater premiered The Secret of Luca. This was the first of several collaborations with librettist Joshua McGuire. In August 2016, their American grand opera Roscoe premiered at Seagle Music Colony to rave reviews. Roscoe received its orchestral world premiere with the Albany Symphony starring Metropolitan Opera star Deborah Voigt. In between the two large scale projects, Mack & McGuire found time to write the first ever opera for Twitter #IsOperaDead – an opera in 5 acts lasting one minute and forty seconds. Their multi-cultural Christmas opera for children, Lucinda y las Flores de la Nochebuena is quickly becoming a holiday standard with yearly productions by San Francisco Opera, Opera in the Heights and Fresno State Opera who commissioned the opera. The one-act opera The Ghosts of Gatsby will premiere by Samford Opera in Birmingham, AL on November 15th. Evan Mack has proven as deft at song writing as he is in opera. His song A Little More Perfect is a setting of Justice Anthony Kennedy’s final paragraph of the Marriage Equality Decision by the Supreme Court in 2015. Premiering at Seagle Music Colony in 2015, it has quickly become a favorite of many baritones including Michael Mayes, Daniel Okulich and Michael Miller to name a few. The song had its professional premiere at the Glimmerglass Festival in 2016 and the orchestral premiere at the Fort Worth Opera Festival in 2017. His new cycle If Only Lenny Were Here, which celebrates the life of Leonard Bernstein had its world premiere with the Schenectady Symphony in October of 2018. 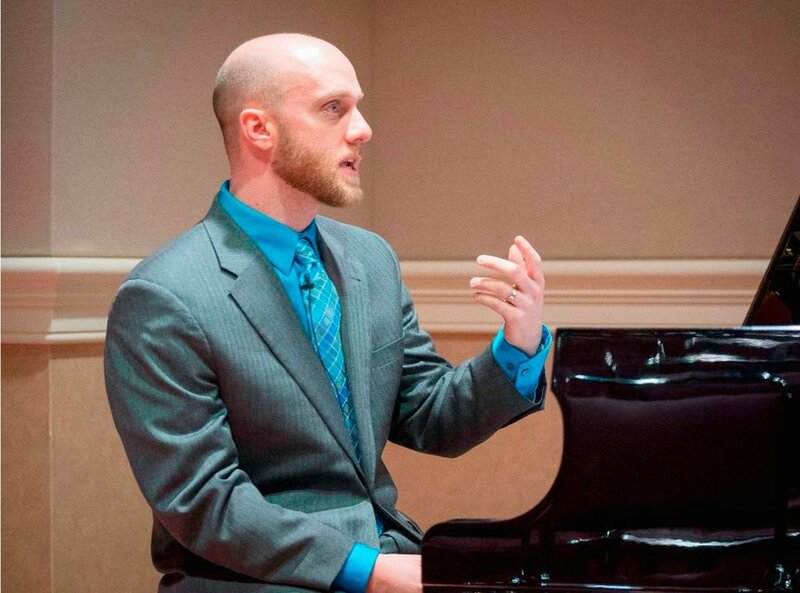 Evan was named “2018 Professional of the Year” by Musical America, was a composing fellow at the John Duffy Composers Institute and a resident artist at Yaddo. He is currently published with Hal Leonard, Alfred, and Amazon. Evan is a Teaching Professor at Skidmore College. He lives in Albany with his wife, Kristin and two sons, Carter and Henry.